Kalayaan calls on the government to ensure that all recognised victims of human trafficking and modern slavery are provided with long term care and support to guarantee their security, recovery and safety. In England and Wales, there is no automatic entitlement to ongoing assistance or practical support once a victim is formally recognised by the authorities. Victims who have been receiving support whilst waiting for a final determination on their trafficking claims, often for months and sometimes years, currently have only 14 days to exit support services and find alternative accommodation and means to survive. The lack of a guaranteed pathway to further support coupled with only 14 days for a recognised survivor to access mainstream services leaves them at real risk of homelessness, destitution and re-trafficking. The risk of being forced into exploitative working and living arrangements is compounded for migrant domestic workers who are accepted as trafficked but not granted discretionary leave to remain. The Modern Slavery Act states that provision must be made for a migrant domestic worker to apply for further leave to remain as a recognised victim of trafficking, however this leave is restricted to work as a domestic worker in a private household without recourse to public funds. An application for further leave needs to be made within 28 days of being formally recognised and documentary evidence provided on how the domestic worker will maintain and accommodate themselves without recourse to public funds. This will be impossible for those residing in safe house accommodation, who have not had permission to work whilst they are waiting for their trafficking claim to be determined and are then made to leave support services within 14 days of being identified. Additionally, if a domestic worker has an outstanding protection claim, their application for further leave will not be processed until their protection claim is determined first. This leaves recognised victims of trafficking facing an undeterminable length of time waiting, no longer eligible for support as a victim and without permission to work. This is inconsistent with those victims granted discretionary leave to remain who have outstanding protection claims who can otherwise work or access financial support. In March 2017, Kalayaan and a coalition of anti trafficking organisations providing direct support and advocacy to victims co-authored a report calling on the government to ensure all recognised victims are given a meaningful rehabilitation period for a minimum of 12 months. In April 2017 the Work and Pensions Select Committee published their report which found an inexcusable lack of support for victims left them destitute whilst their abusers go free. The Committee echoed our recommendations and called for all recognised victims to be given at least one year’s leave to remain with recourse to benefits and services, allowing victims to receive advice and support and the time needed to plan their next steps. In response, the government has made a series of announcements as part of the reforms being made to the National Referral Mechanism and the support being offered to victims after they are identified. They have announced their intention to provide victims with a longer period of move on support from 14 days to 45 days and drop in services for up to 6 months to aid the transition. Whilst this is a welcome first step, it does not guarantee the security and stability victims need to recover from the ordeal of being trafficked. The government does not agree that all victims should be granted discretionary leave to remain. Their response to the Work and Pensions Select Committee states a blanket policy ‘risks incentivising individuals to make false trafficking claims in an attempt to fraudulently obtain leave to remain or delay removal’. There is no evidence to substantiate this. This argument forgets that victims cannot consent to being trafficked and traffickers do not seek to exploit people with the aim that they should escape and receive leave to remain with recourse to benefits and services. The identification process will also ensure that any fraudulent claims are filtered out and issued negative decisions. The call for long term support is for those individuals conclusively accepted by the authorities as trafficked. 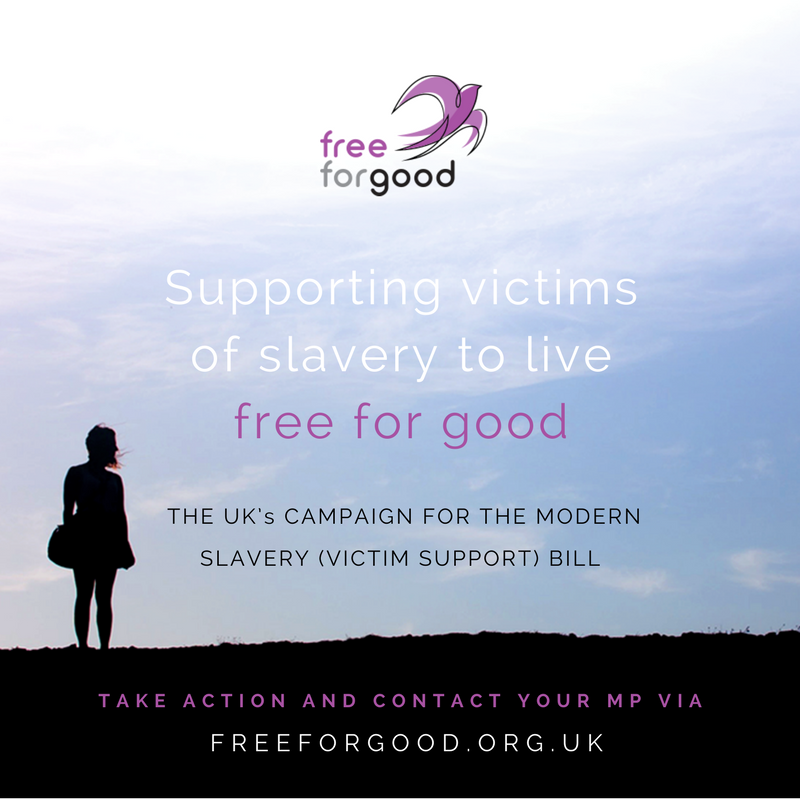 Kalayaan is proud to support the Free For Good campaign in partnership with a number of other leading UK anti trafficking charities and organisations. The campaign backs legislation that enshrines victim support into law and has been set up to mobilise support for the Modern Slavery (Victim Support) Bill which would guarantee all recognised victims to be given leave to remain and specialist support tailored to individual need for 12 months. The bill specifies the minimum standards of support that victims must receive, ensuring that no victim falls between the gaps at risk of further exploitation or harm. Please visit the Free for Good website to learn more about the campaign and to ask your MP to pledge their support and back the bill as it proceeds through the House of Lords into the House of Commons. The bill is currently in the House of Lords awaiting a date for committee stage. The bill received cross party support at second reading and Kalayaan wishes to express particular thanks to Baroness Cox for highlighting the difficulties still faced by migrant domestic workers in spite of recent provisions. Kalayaan’s briefing for second reading of the Modern Slavery (Victim Support) Bill is available here.